The brake system on your car is important because it allows you to stop the vehicle and slow down when needed. 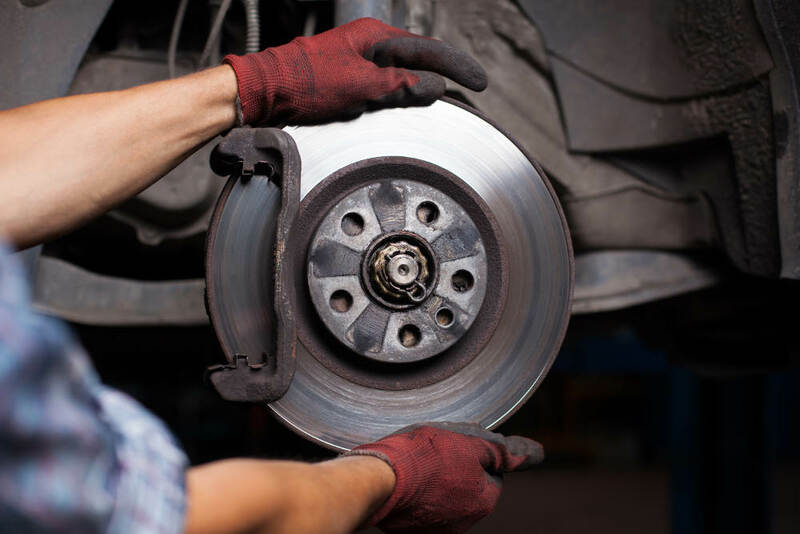 If there are issues with the brakes, then it could result in hitting another vehicle or could mean more repairs to your vehicle aside from brake pads or rotors. Road Runner Auto Care in Apple Valley can examine your brakes to determine if they need any kind of repairs or if they are in proper working condition. You can examine the brakes yourself if you know what to look for on the car. Pay attention to any noises that are coming from the brake system. These noises include squealing or squeaking when depressing the brake pad. This sound usually means that your brake pads are worn and reaching the point to where there isn’t anything left of the pad before it reaches the rotor. 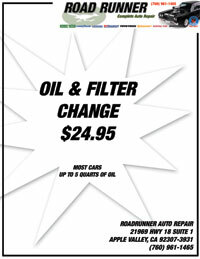 Road Runner Auto Care in Apple Valley can remove the brake pads and put new ones on in a short time so that it’s safe to drive your vehicle. Another sound to listen for is grinding. If you hear this noise, then there is usually something wrong with the rotors. They can sometimes be turned by Road Runner Auto Care, but if the grinding is severe or your vehicle swerves when you brake, then the rotors might need to be replaced. You can usually view the brake pads through the spokes on the wheel of your car. The pad will typically be pressed against the rotor. Examine your pads each month to determine how quickly they are being depleted. If you notice that the pads are wearing down fairly quickly, then you might need to get a better brand of brake pads or examine the braking system itself to see if there are any issues with the line or the fluid.